The final major of the year in tennis, the 2018 US Open wrapped up this month, providing fans with many memorable moments. Rising tennis star Naomi Osaka won her first grand slam title and became the first player from Japan to win a major tennis tournament, Novak Djokovic won his 14th career grand slam title, equaling American tennis great Pete Sampras, and lest we forget, Serena Williams, the six time US Open champion, found herself amid a controversy which continues to make headlines. However, as with any major sport, the competition does not just play out on court by the players, but off the court by sponsor brands through their athletes, broadcasts, social media and other channels. 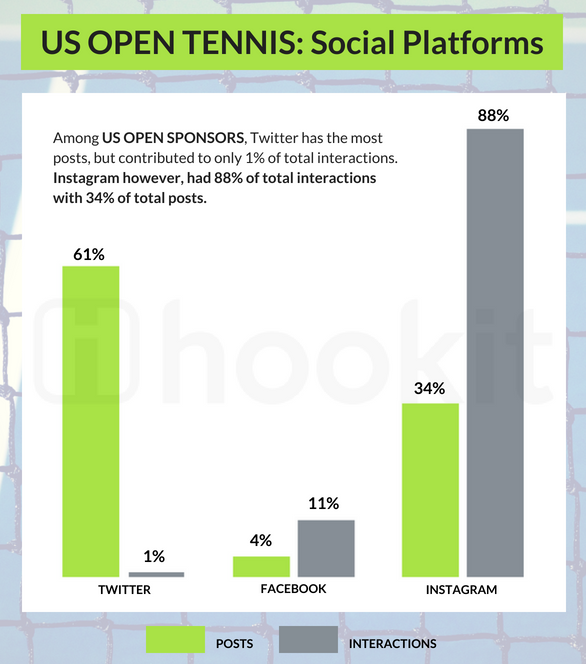 Hookit’s research of the US Open aims to identify these brand winners as well as athletes and other entities who gained the most value and interactions on social media. Methodology: Sponsor brands of the US Open and sponsor brands of the top men and women seeds of the US Open(64 athletes in total), along with wild card entries Stan Wawrinka and Victoria Azarenka were considered for analysis. Time period considered was the duration of the US Open: August 27, 2018 to September 9, 2018. The US Open has 20 sponsors, with the majority of sponsors from the financial services and beverage industries. 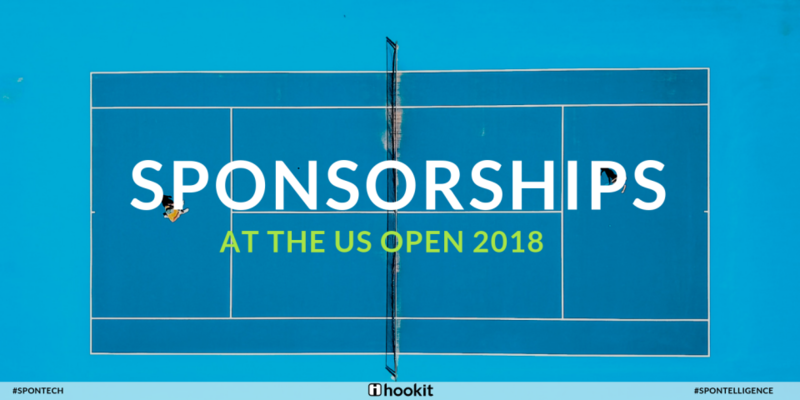 Social media activity among sponsored brands were low, and only 10 of the 20 brands promoted posts relating to the US Open (i.e., used the hashtag #USOPEN or mentioned @usopen in their social media posts). With 143k total interactions, Emirates had the highest number of interactions among sponsor brands of the US Open, followed by The New York Times with 107k. Italian coffee manufacturer Lavazzo was third with 40k total interactions followed by multinational financial services company American Express with 17k interactions. All other sponsor brands who had promoted posts on social media had less than 20k total interactions combined. Players were more successful in promoting their sponsor brands, with Nike taking top place among sponsored brands in terms of fan engagement on posts promoting their brands. Among the 64 top seeds (men and women) of the US Open, 29 players were sponsored by Nike, followed by Adidas with 11 sponsored players and Asics with 7 players. Nike earned the highest media value with $3.1M, while Adidas was at a distant second with $485k. 97% of the value earned by Nike came from promoted social media posts by Serena Williams, who also promoted her sponsor Beats by Dre for an earned media value of $338k. Novak Djokovic — 2018 US Open champion, generated total EMV of $277k for sponsor Asics. Maria Sharapova — 2006 US Open champion, drove $197k in EMV for sponsors Ralph Lauren ($156k) and Nike ($42k). Stan Wawrinka — 2016 US Open champion, drove $101k in EMV for sponsors Evian ($69k) , Audemars Piguet ($16k) and Yonex ($16k). Sporting goods manufacturers Lacoste($90k), Fila ($56k), Lotto($39k)and equipment manufacturers Babolat($90k) and Prince($30k), technology company IBM ($21k) and premium luggage manufacturer Rimowa ($87k) were the other brands promoted by sponsored players on their social channels. One interesting thing of note is that, a large number of players promoted their sponsor brands 5–10 days before the US Open began, and generated considerable EMV for their sponsors. When considering the same players over the time period of August 17-August 26, i.e, 10 days prior to the start of the tournament, there are significant value generators among the players. 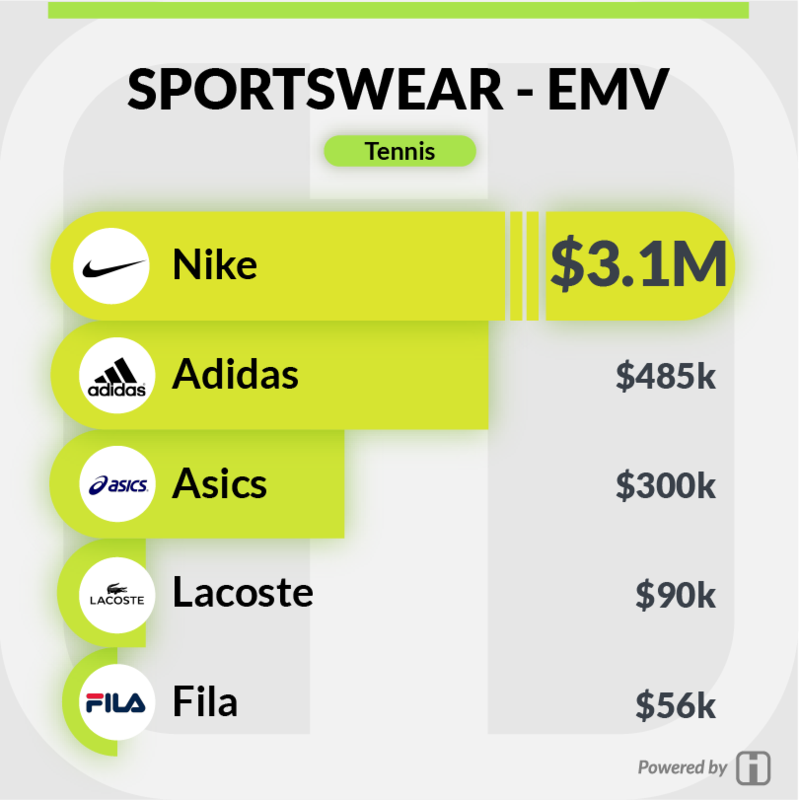 Considering all brands promoted by players over the time period, Nike leads again in EMV, with $1.1M generated by its sponsored athletes through social media. Lacoste is second with EMV of $833k, followed by Chase Bank with $439k and Adidas with 390k. Serena Williams may have lost her championship on the court, but with 17M interactions across her social channels, she was undoubtedly the social media champion of the US Open. Her social media interactions were 1.2 times more than the social interactions of the other 7 semi-finalists COMBINED. However, the controversy surrounding the women’s final was also a major contributor to Serena’s social media engagements. 82% of her total interactions were from Instagram, followed by Facebook at a distant 11% and Twitter with 7%. Novak Djokovic was second with 7M social interactions followed by Rafael Nadal with 4M social media interactions. Women’s championship winner Naomi Osaka had 2.5M interactions across her social channels making her fourth in overall interactions. 70% of her interactions were on Instagram followed by Twitter with 26% of total interactions. 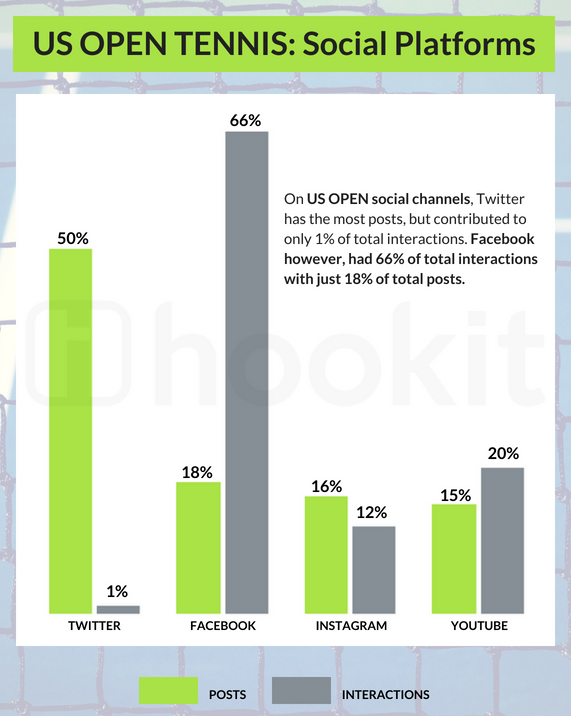 The US Open social channels had over 145M interactions during the tournament, with Facebook contributing to 66% of total interactions. YouTube was the second largest contributor with 20% of total engagement, followed by Instagram with 12% and Twitter with a measly 1% of total interactions. The top 5 posts of the US Open with the highest interactions were all videos on Facebook. Nadal’s quarter final celebration was the most watched video, and an emotional moment between US Open champion Naomi Osaka and her mom after winning the championship was the second most interacted post of the US Open. The top 5 posts promoting the sponsors of US Open generated a combined EMV of $169k. The US Open’s promoted posts about sponsor Heineken earned a media value of over $66k while promoted posts about American hotel chain Westin and Grey Goose vodka yielded earned media value of over $51k each. Note: Earned media values in this article do not include logo promotion and value. Promoted posts with logo values may be higher. Who according to you won the US Open brand challenge? Sound off in the comments below! Don’t forget to check out Hookit’s free guide on the motorsports industry with social media stats about all motorsports entities in 2017!